At the mouth of the lush Juarez Park is El Chorro . While this is often the perfect sunlit spot for musicians, buskers, artisans and gathering tour groups, it was and still is a laundering station for some of the local women. The square basins are fed by a natural spring and YES, the water is ICE cold! 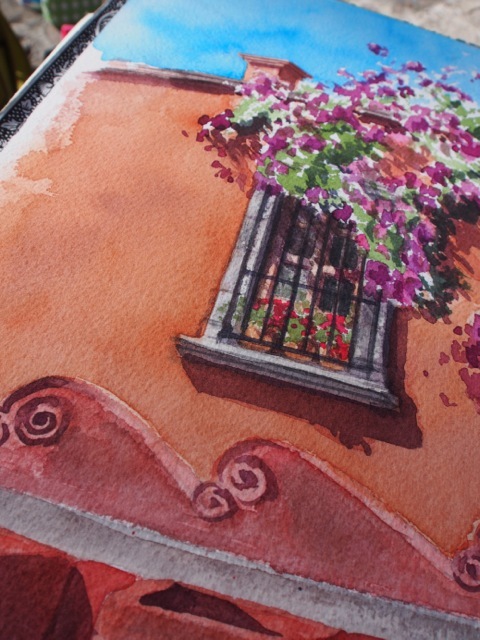 Since it wasn't being used the day we were there, we snuck water for our paint… so our pieces were infused with the spirit of San Miguel! Around the corner, up the cobblestone streets and behind the ornate black wrought iron gate is the exquisite 2.5 acre home and gallery of the inimitable and famous Canadian ice skating champion (now popular artist) Toller Cranston. Years ago I had the pleasure of meeting him and getting tour of his space - a fantastic world of coloured glass, pottery, mobiles and art, art ART! His studio is a glass gazebo, not unlike a delicate crystal bird house, complete with flitting butterflies (seriously!). 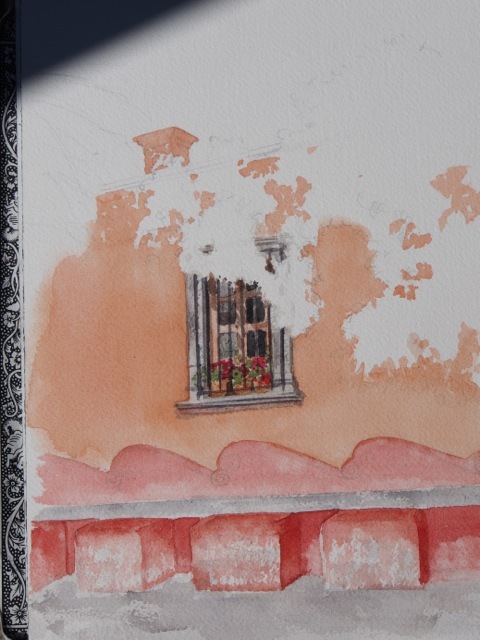 Our intention was to just paint at El Chorro for the morning, but the setting was so pretty; bougainvillaea cascaded over the wall, the dark window contrasted beautifully with the coral stucco texture and shadows danced jauntily over the whole scene. By the afternoon we were in full blown sun and were experiencing our first really hot afternoon. A welcomed treat. 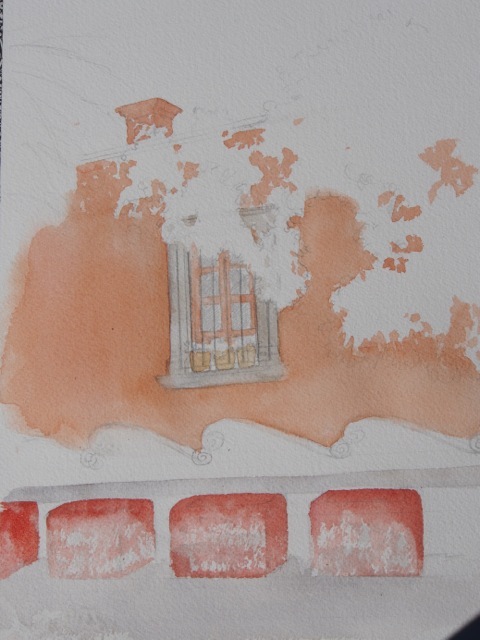 As with several of our plein air paintings, we began with the shadows as they were changing FAST! Then a wash of coral; permanent rose + raw sienna and for the basins; permanent rose + burnt sienna.